Today the OH & I are celebrating our 6 year anniversary! So as a treat I brought him to the Light House for brekkie. 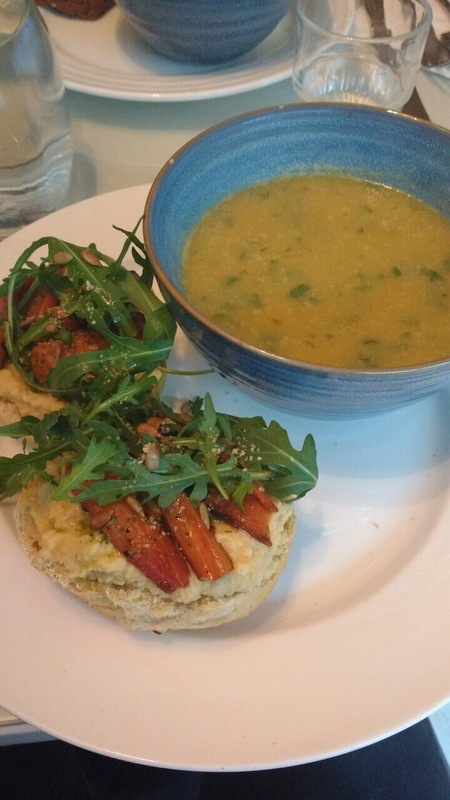 Breakfast: toasted bread with hummus, honey roasted carrots, pine nuts and rocket with celeriac and parsley soup from the Light House. The food was lovely. Really wholesome and tasty. Tad bit pricy for what it was was but oh well! Lunch: leftovers from yesterday’s dinner – Quorn chicken and broccoli stir fry. Snacks: got a hazelnut and fig loaf in M&S that was reduced so had a few slices of that with hummus from McCambridges.